Anyone who is hoping to shoot videos in low light or completely dark conditions will need a night vision camcorder (Source). These cameras are ideal for people who often go camping or hiking, when they may want to record some video of their surroundings at night. A night vision camcorder is also a great gift for kids or teenagers. Such kids usually like to experiment with ghost hunting or capturing videos of dark environments. It can be hard for the average person to understand whether a specific night vision camcorder is worth the money. Each camera promises the best performance with its specifications. But we know that specs are not always indicative of real-world performance. When buying a night vision camcorder, you’ll want to understand how these cameras work. Also, you’ll want to examine its resolution, durability, and other features. Any of these five night vision camcorders will do a stellar job, especially if you are taking videos at night. 7.1 What is Night Vision? 7.2 How Do Night Vision Camcorders Work? The Bestguarder HD Digital Night Vision camcorder is the best option for people who want to shoot video in low light or completely dark conditions. It is not the best camera for taking videos during the day, but it offers exceptional night vision performance. With a maximum resolution of 720p, the Bestguarder will not look as good as some of the other cameras on our list in daylight conditions. If you are seeking an all purpose camcorder that also does night vision, it may not be the best choice for you. 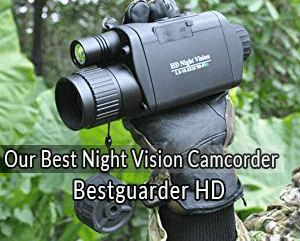 But enthusiasts who want a dedicated camera for night vision will love the Bestguarder. It has a built-in infrared illuminator that delivers a viewing distance that is up to 1150 feet! Even when it is completely dark, you can produce night vision videos that are clear and easy to view. The built-in 1.5 inch screen makes it easy to change settings, while there is a 1-5x digital zoom feature. You can even set up the camera with an external battery and mount it as a surveillance camera! Its body is exceptionally rugged, delivering IPX water resistance and a very durable exterior. Best night vision performance – by far. Long viewing distance of up to 1150 feet, even in pitch black conditions! Menu is easy to navigate. Rugged body that will not break from a few drops. Only 720p resolution, which results in average videos during the day. 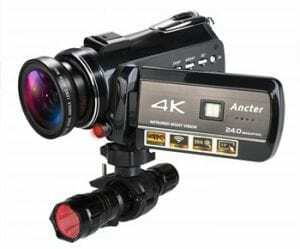 If you are seeking an all purpose camcorder that will also produce some decent results at night, the Ancter Ultra HD Infrared Night Vision camcorder is a terrific option. The top resolution of the camcorder is 2160p. Featuring an IPS touchscreen that you can use to navigate the menu, it is very easy to go between the different modes on the Ancter. You can have regular night vision, while there is also an infrared flashlight that you can turn on for added brightness. The night scenes do get very bright with the Ancter. The only issue is that you can have a good deal of noise in those videos, depending on the conditions where you are shooting a video. We found the night vision performance slightly worse than the Bestguarder, but it is still very impressive. Another feature that users will love on this camera is the WiFi capability. You are able to remotely view videos on your smartphone or tablet, while you can even download videos directly onto your smartphone. It comes with an app that you can add to your Android or iOS device to access these features. Night vision capabilities are very respectable. Infrared flashlight adds more brightness to night scenes, if necessary. 2160p resolution produces very good daytime results. Night vision performance is good, but worse than Bestguarder. Much like the Ancter, the Seree camcorder is a 2160p video recording device that will deliver very good performance in most conditions. If you are shooting video during the day or as the sun sets, the resolution will help you achieve great results. The night vision on this camcorder is very respectable. If you are indoors and recording videos in the dark, you will be able to see a lot of detail. Some objects may be too bright, while others are a little dull, but the videos are very watchable. And the same is true when you are shooting video outdoors in the dark. Say you want to ghost hunt or shoot some nighttime videos while camping. The results will be very respectable, as you can see the various objects in pitch black conditions. But there is some noise in the video and some objects can seem far too bright. The Seree camcorder has WiFi connectivity, which allows you to connect it to an iOS or Android device to transfer videos and share them with your friends. 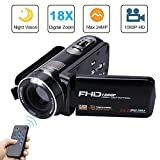 You can even connect the camcorder to a television with an HDMI cable to watch videos on a big screen! Offers proper night vision capabilities, even though the results are mixed. 2160p resolution is excellent for recording video in brighter conditions. WiFi connectivity lets you transfer files to smartphones. Connect to a TV using an HDMI cable. Low light performance can be inconsistent, with some objects or figures being far too bright compared to the rest of the scene. The Cleveland Paranormal Supply Co has designed a video camera that is perfect for ghost hunting enthusiasts. 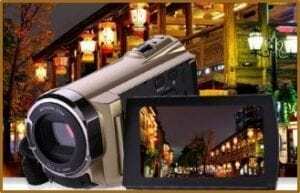 If you love to explore various areas in your town at night, you will have a lot of fun with this camera. It is also good for shooting any type of night time video. With a max resolution of 2160p, you are getting 4K quality when you are using this camera in any condition. And the night vision performance is good enough to deliver respectable results. You can choose between infrared and full spectrum night vision, depending on what type of videos you prefer. We would advise trying out both in different conditions so you can understand what works best in specific scenarios. With a wide angle lense and good battery life, you can be out for the night and get a lot of footage with this camera. Built-in WiFi means that connecting to Android or iOS devices is very easy, which supports remote viewing and file transfers. 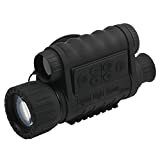 Offers both infrared and full spectrum night vision. Very easy to use with its IPS screen. WiFi connectivity and compatible with iOS/Android devices for remote viewing and file transfers. Night vision performance is good, but not great. Many users have complained about some videos being far too dark, while using infrared or full spectrum mode. If you do not want to spend a lot of money on a night vision camcorder, the Weton camcorder is an excellent choice. It offers a 1080p maximum resolution, while the 3 inch screen makes it easy for you to navigate the menu. You get up to 18x digital zoom, even though the videos can be a little blurry if you are zooming all the day while recording. The quality of the internal microphone is very good, which means you do not have to worry about poor sound on your videos. The night vision mode on this camcorder is only infrared. While you will get some decent shots if you are in a dimly lit environment, it will be tough to get good videos when it is pitch black. Those who like to record videos at night in the wilderness may want to find another model. But if you are recording night time videos indoors or around a city, where some light is present, you will get decent performance. It is the type of camera that you can use to get interested in recording night vision, before you upgrade to a more feature-filled model such as the Bestguarder. Very affordable night vision camera. Up to 18x digital zoom. Only infrared night vision, which produces mixed results. People who take most of their videos in good light conditions will be happy with a regular camcorder. If you are shooting videos while the sun is out or in brightly lit indoor conditions, you do not need a night vision camcorder. But those cameras perform very poorly in dark conditions. 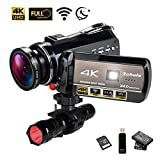 You will barely be able to see anything besides darkness, even if you have the latest 4k camcorder with exceptional features. To understand a night vision camcorder, we must understand night vision. It offers the ability to see in low light conditions. By adding sufficient spectral and intensity range, it is possible to make a camera that can show us what is happening in dark conditions. The technology for a night vision camera is similar to night vision goggles. The most common use of such glasses is within the military, where soldiers must be able to see when they are out in the dark. The tech may not be as advanced in the average night vision camcorder, but it is a similar concept. How Do Night Vision Camcorders Work? When you step outside at night and there are no street lights, it can seem pitch black. But it does not mean there is no light present in the area. There is always some light. It is just too dim to allow our eyes to see clearly in those conditions. A night vision camcorder will take in the dim light that is present in a night scene, even if it may seem pitch black to you. The light enters the camera, where it strikes a surface called a photocathode. The goal of the photocathode is to convert photons into electrons. Those electrons pass through the photocathode and into a phosphor screen. As they hit the screen, small flashes of light are created. And since there are so many more electrons hitting the screen, as compared to the light that first went into the camera, the result is a much brighter version of the scene that is present before our eyes. The clarity and brightness of a night vision scene will depend on the quality of the camera. Not every night vision camcorder is created equally. 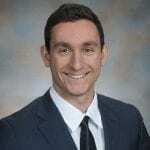 While some cameras may advertise night vision and a high resolution, the quality of the night vision scenes may be worse than a camera with lower resolution but better night vision technology. Those who are buying a night vision camcorder solely to record scenes in pitch black conditions do not need to worry too much about resolution. Even if a camera only has a 480p or 720p maximum resolution, it can serve as a very good night vision camcorder. The quality of a night vision scene depends a lot more on the tech used to create those scenes. Resolution will be important in a night vision camcorder for those who are planning to use it in all conditions. For instance, you may want a single camcorder that you can take with you on trips. When you are hiking, fishing or camping, you will probably record video in the day and night time. A camera with a high resolution and good night vision will give you very good videos in all conditions. In such a situation, a camera that only has a 480p or 720p maximum resolution may disappoint in the daytime scenes, even if the night time scenes are very good. A camcorder should be able to survive outdoor conditions. While you probably do not want to be recording as it is pouring rain, a rugged body is important. Those who are planning to use their night vision camera outdoors do not want it to break the first time it falls from five or six feet! Some cameras even have water resistance, which is a very handy feature. While it does not mean you can take the camera in a swimming pool or river, it does mean that a few splashes are not going to reach the internal components of the camera. Buying a night vision camcorder will completely change the way you shoot videos in dark conditions. While your previous videos may barely show any detail beyond pitch black, you will be able to see the surroundings and subjects in night vision videos. Those who love to ghost hunt, capture videos in nature at night, or want to mess around with different night vision settings will love these cameras. If money is no object, the Bestguarder HD Digital Night Vision is the best option on the market. While its top resolution is only 720p, it offers the best and most consistent night vision performance. The Weton Camcorder is also a solid choice if you are on a budget, even though its night vision quality is not as good as the Bestguarder model. We hope that our guide has made it easier for you to choose a night vision camcorder for recording videos in dark conditions. And, if any of our readers have experience using these cameras, please leave a comment below. We want to hear about your experience with any of these products!